Communicating with parents is one of the most challenging and potentially stressful tasks that teachers face on a daily basis. Whether trying to resolve a heated argument or delivering bad news, it is essential to know how to handle difficult situations and establish positive relationships with your students' parents. 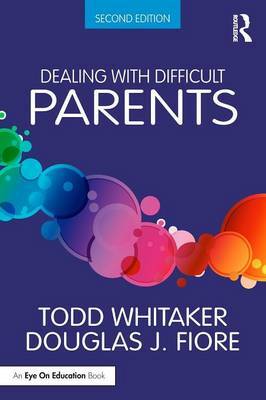 In this updated second edition of the bestselling Dealing with Difficult Parents, award-winning educators Todd Whitaker and Douglas J. Fiore help you develop a repertoire of tools and skills for comfortable and effective interaction with parents. A new chapter on initiating contact with parents to build positive credibility. This must-read book will equip you with the skills you need to expertly navigate even the most challenging encounters with parents, and walk away feeling that you have made a positive and meaningful impact.